It was an ordinary Friday where everyone is hailing for the arrival of weekend. Despite of the Gangnam style these days, I had the feeling of being a Korean wannabe. 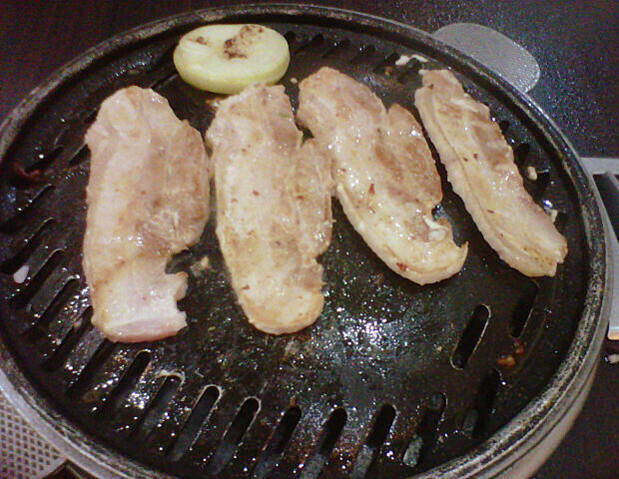 Le boyfie and I are meat lovers and we thought of giving San Nae Deul a try, as my friends kept telling me the food was awesome. San Nae Deul is located near Galaxy Ampang, and it is freaking near to my house. 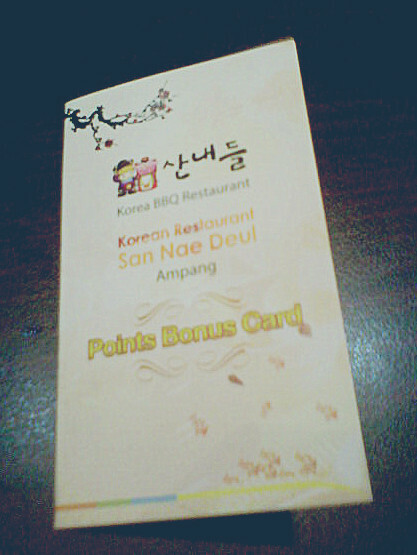 If you are staying in Pandan Indah and have no where to go for dinner, give it a try at San Nae Deul. It's only 10 minutes with car distance. 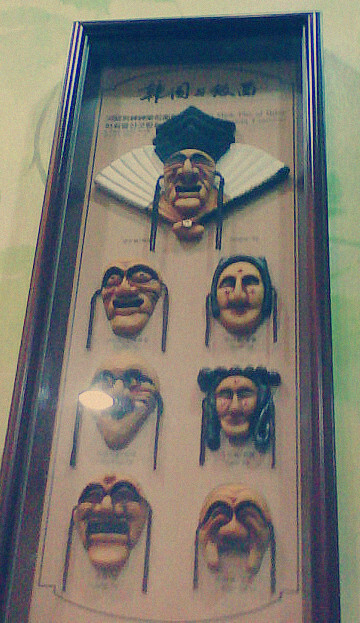 I was literally amazed with the masks hanging on the wall. I find it amusing, rather than disturbing. 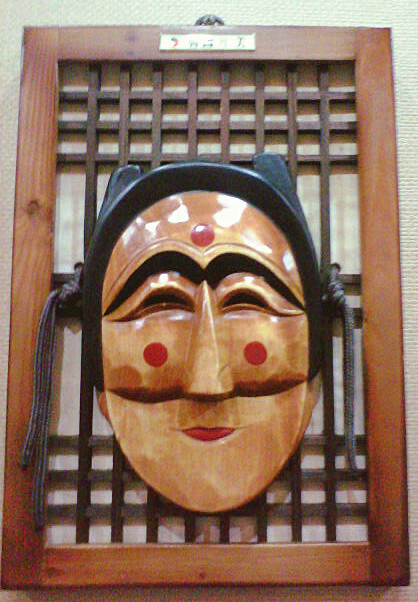 Here is a bigger view of a mask. But this, I had to say it is disturbing. 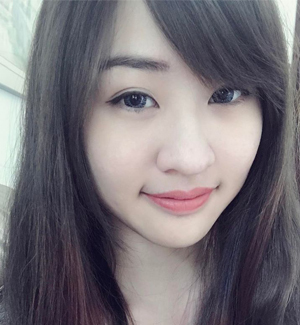 Look at the pedo smile! These, are for you to wrap the meat, rice and side dishes so you can put them in your mouth just just a bite. 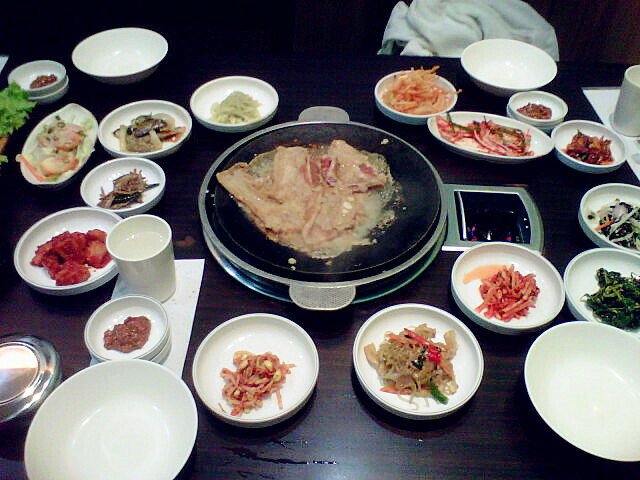 More than 10 side dishes! Look at these side dishes, aren't they lovely? 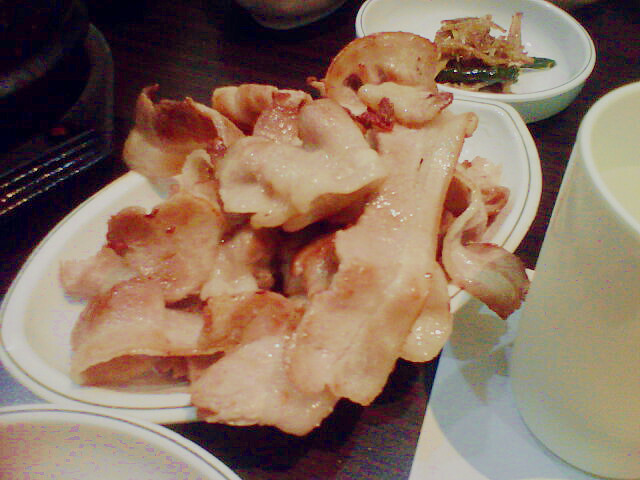 The only sad thing was, the kimchi were given in big sizes. I wasn't happy about it. 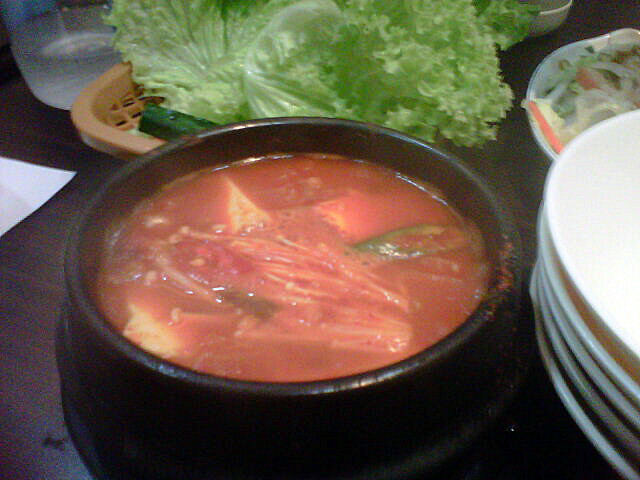 Kimchi, Y U NO small size? I find it rather salty. I took a few pieces and I still don't find my liking towards it. This is my favourite. Simply pure and juicy pork slices. They were not over-cooked and I love it. It was too spicy. A sip of it might need you to drink water. So ended up you are full because of taking in too much liquid. Maybe the kimchi soup wasn't perform its best that night. It wasn't as thich as I expected! 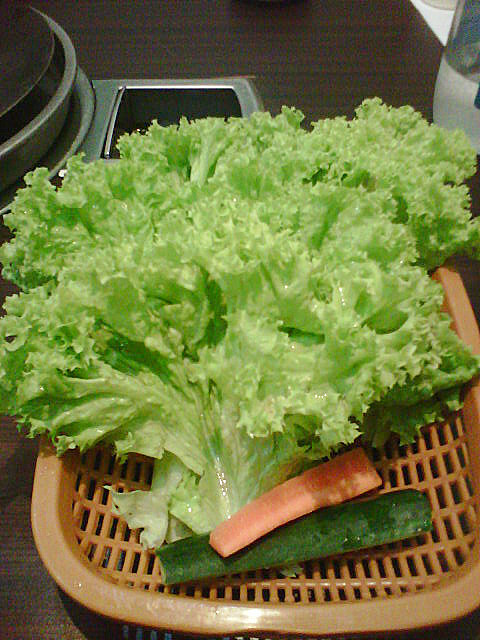 The one I had in Korean village were thicker than these. I guess that is why it is slightly cheaper than the one we had in Korean Village. This is a cute membership card provided by San Nae Deul. I sort of love the pastel colors on it. I should learn to read the Korean menu instead of looking at the images. Will I be going back to the San Nae Deul? Oh yes I will, it was absolutely a yes since I only paid for RM 16 for all the meals above (the total amount divided by 5 person). CHEAP RIGHT? 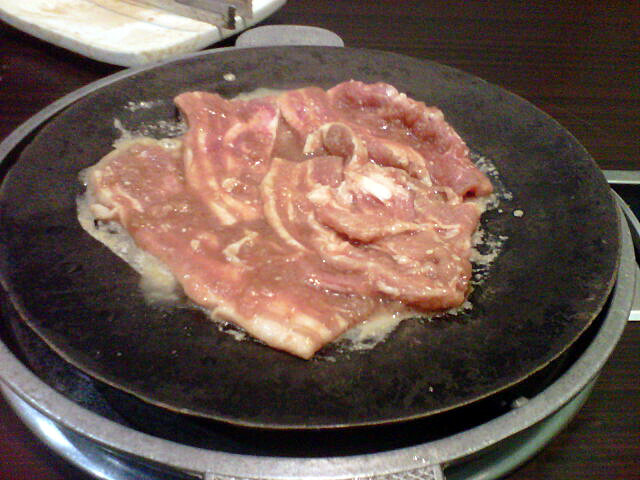 It's the cheapest Korean meal I ever had leh. y u no eat tgt? the mask, it my mast actually! why u no steal them so I can steal from you LOL! thank you for your comment too! Hehe the food are yummy. U heard of Uncle Jang?